Hello, dear artists and comic book lovers. 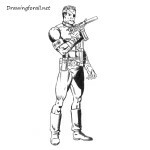 The team of DrawingForAll already showed you how to draw Quicksilver from Marvel Universe. 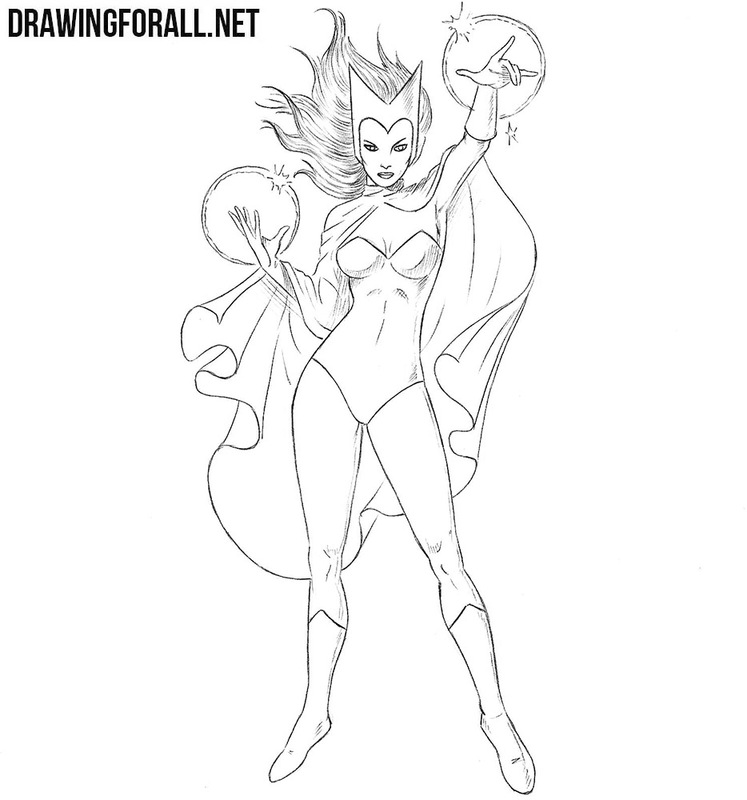 Today we will show you how to draw his sister – Scarlet Witch. 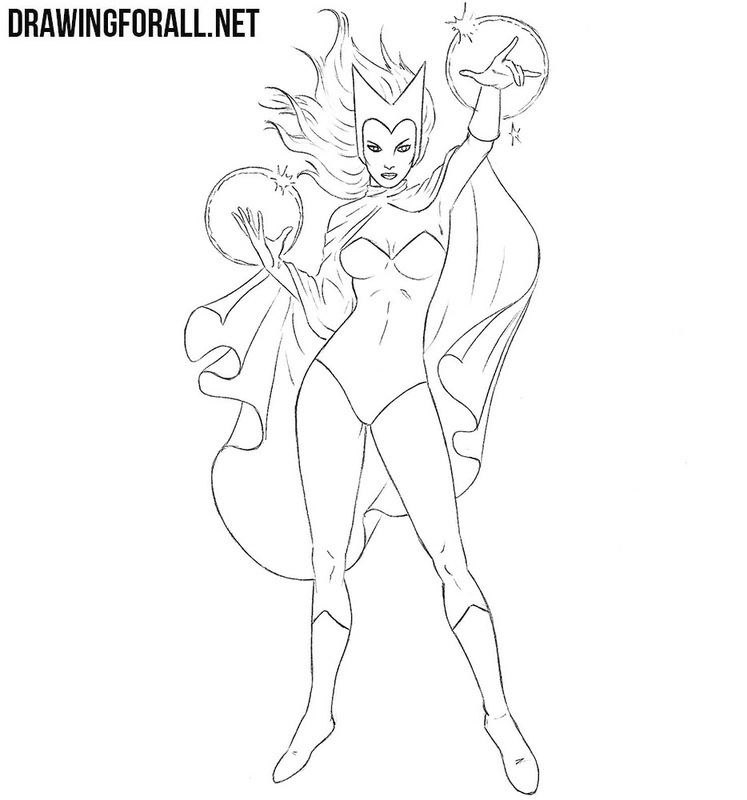 As you know, Scarlet Witch is the character of the Marvel Comics universe. 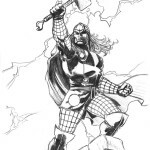 She was created by screenwriter Stan Lee and artist Jack Kirby and first debuted in X-Men # 4 in March 1964. 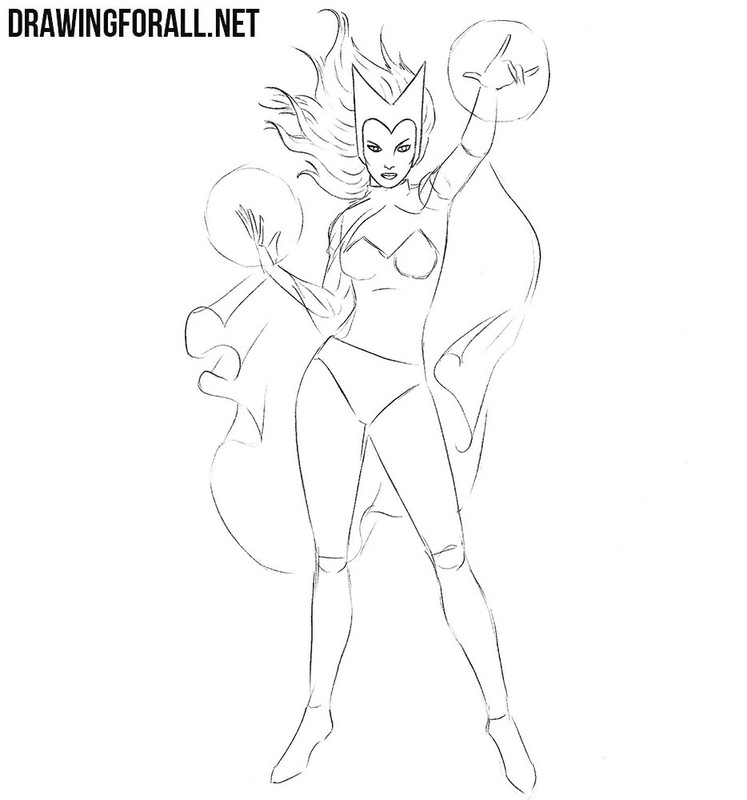 So, let’s begin the lesson about how to draw Scarlet Witch. 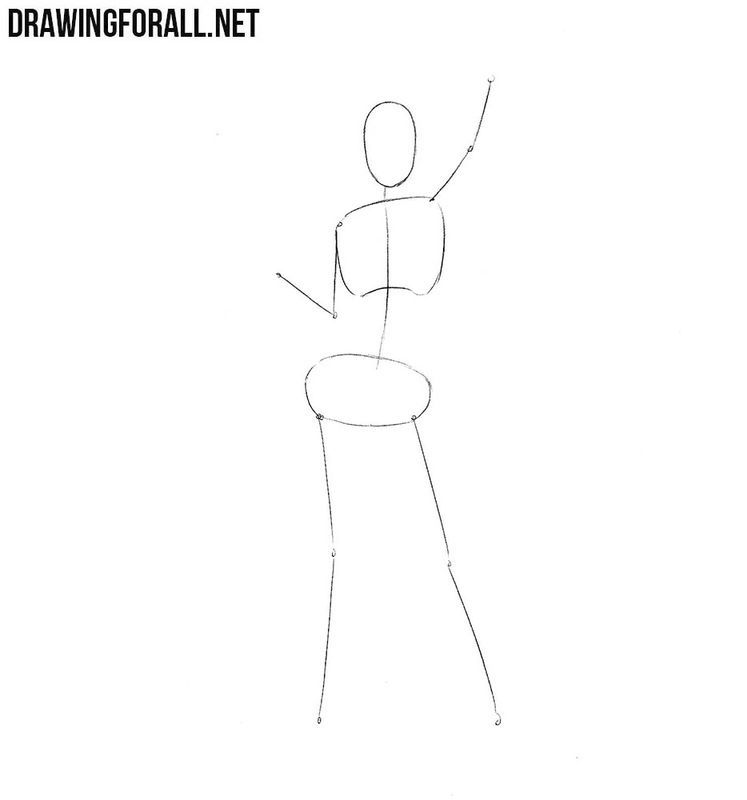 We need our drawing to be smooth, proportional and beautiful. For this we need to draw a skeleton, the so-called sickman of the character. First of all sketch out the head in the form of an oval. After this sketch out the spine, on which the thorax and pelvis are located. Now, with the help of simple lines, sketch out the arms and legs. Now add some volume to the body of our character. Now outline two intersecting lines on the face. They will help to draw details of the face. Now sketch out the neck and torso, which strongly narrows at the waist and widens in the hips. Draw thin arms and legs, which widen in the hips and narrow closer to the knees. 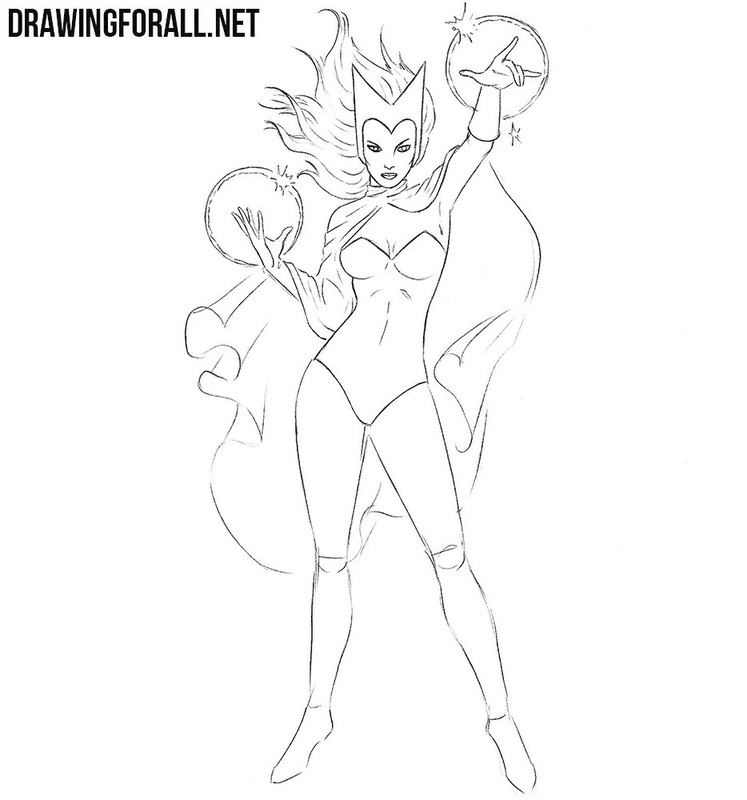 Now let’s add the main details to the Scarlet Witch drawing. First of all sketch out features of the face using simple lines. Next, draw a mask and long hair. Now sketch out the cape, the elements of clothing on the torso and two circles around the hands. Now we start to work with the final details. First of all, carefully draw out the features of the face using clear and dark lines. Next, draw the mask and hair with long curved lines. Do not forget to remove all unnecessary guidelines from the head. 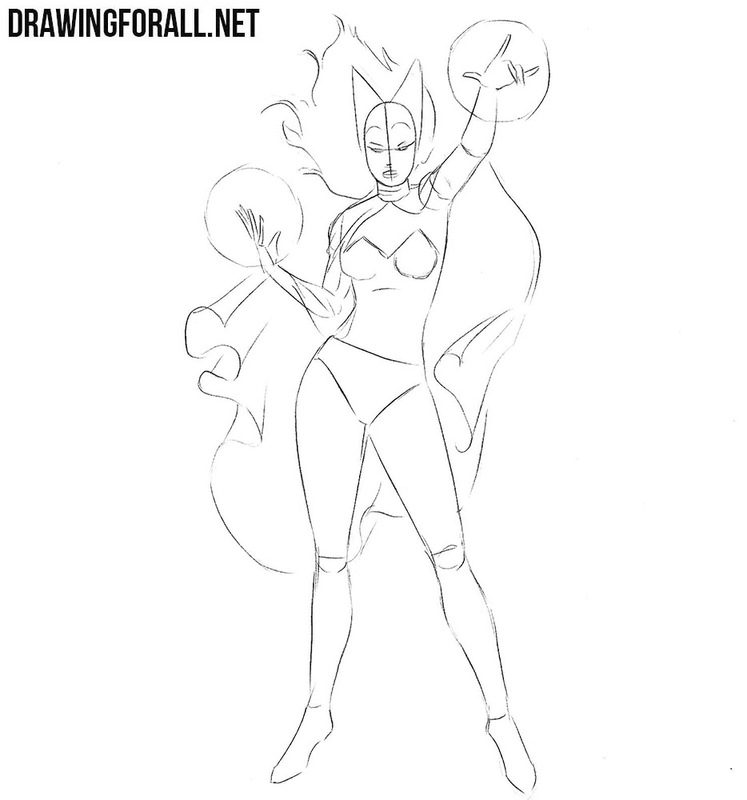 Now let’s move on to the torso of our Scarlet Witch. Using curved lines carefully draw out the shape of the torso. Erase all unnecessary guidelines and draw out lines of clothing on the torso, considering the shape of the body under the clothes. Now we pass to the arms of Scarlet Witch. First of all, draw parts of the cape that are on the neck and shoulders. Draw all the folds as in our example. Next, draw out the outlines of arms and gloves. To learn more about hands, visit the lesson about how to draw hands on our website. Do not forget to draw shining circles around the hands. Using clear and smooth lines draw out the cape. Next, carefully draw out the outlines of the legs, using smooth lines. Sketch out the shape of the muscles and knees with a pair of short lines. Delete all remaining guidelines. With the help of smooth lines draw the hair. Now let’s work with shadows. In comics usually used dark and contrasting shadows, as in our lesson about Spider-Man. In this lesson we will apply a slightly different technique. First, we’ll determine the light source, and then using light hatching we add shadows to those areas where the light does not fall. It was a lesson about how to draw Scarlet Witch. In the end of the lesson we want to give you a couple of tips. The first thing you should know when you draw a female character is the difference in proportions from a male character. 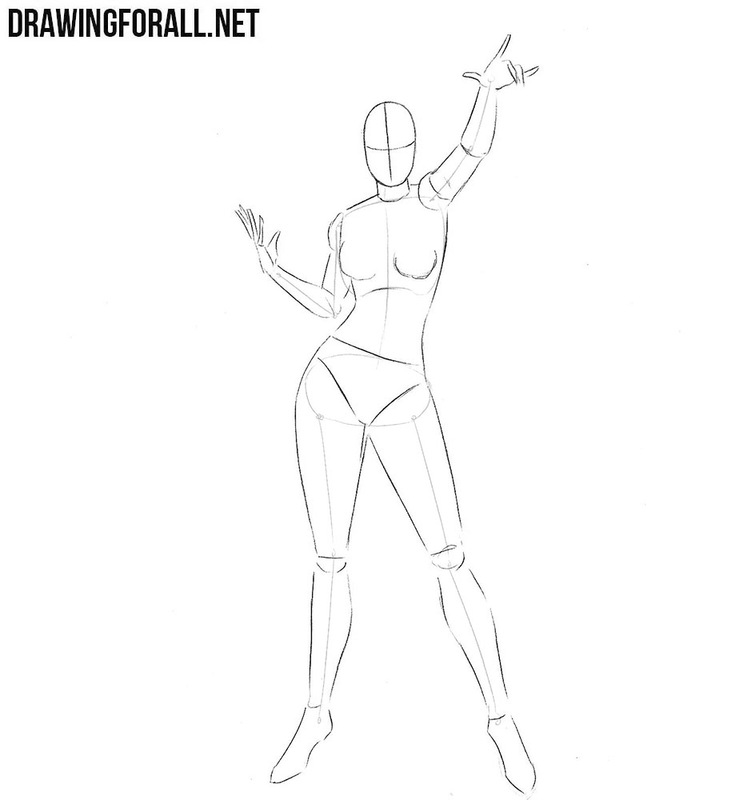 The female figure is usually more refined, the shoulders are narrower and the hips are wider. Hair should be drawn from the roots to the tips, so they will be more real.